Nat’anael couldn’t help sighing. She turned her ring over and over, finally holding it in front of her to stare at the sapphire that twinkled at her. “The time is not now. I can’t stand to stay in on such a fine day. I’m going out,” Nat’anael said, grabbing her sling bag from the chair. She clattered down the stairs, lost in her thoughts, coming to a sudden stop when she was suddenly confronted with a pair of blue eyes. “Your Highness,” she mumbled in greeting, hoping that her cheeks weren’t too red. Nat’anael caught herself mid-shrug. “If Your Highness will permit?” she bit off the words, regretting them almost instantly as he flushed. She allowed herself to sink into his deep eyes for a moment, eyes that matched his heraldry, eyes that were mirrored in the sapphire that hung against her heart, eyes that were scrutinising her now. She ignored his call, knowing that he wouldn’t chase after her. As soon as she was far away enough from the manor, she pulled out the ring that hung on a thin golden necklace from where it dangled between her breasts. The gem glinted between her fingers and she sighed again, wishing she could take back the edgy words that stood between her and Maitwe. “Way to go, woman. This is exactly the way to make him fall in love with you,” she said as she tucked it away safely again. She hated the way the azure skies taunted her. The word "Azure" brought to mind the first novel I ever attempted (and which I still laugh over occasionally) which featured a princess with green eyes and a prince with blue eyes. They were betrothed to each other as babies and their parents exchanged rings that represented the colours of their eyes to seal it. This snippet derives from that story, which I haven't touched in about a decade. Last note, promise. I think I've turned off word verification, but then again I thought I did before and it somehow reverted back. So I hope it doesn't turn up anymore! Intriguing tale, pulling in the readers and making them want to know more :) Beautiful story.Will visit again to see where it goes from here. I believe the word "azure" is one of the most beautiful. Thanks for sharing the excerpt. I had fun re-reading that story to get this excerpt out for all of you! Azure is my favourite colour! I like the contemporary edge of the characters in a fairytale setting. Glad to know the contemporary edge works for you. I was struggling with that for a while. That was a nice excerpt. 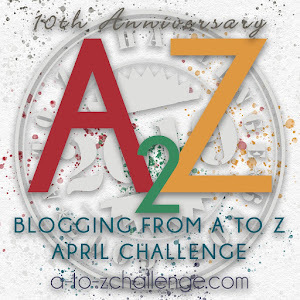 I am right ahead of you in A to Z Challenge. so I will be checking your blog frequently. Intriguing tale - great "A" word - brings forth visions of beautiful, deep, enticing blues. I love any words that carry a certain level of mystique. Azura is definatly up there. I have to fight against having eternally azure skies when I am writing. It's one of my favorite color words! I like this excerpt; hope to read more of it! Yve has to show up. She always does. I love the word Azure too. I think it's intriguing in your story how they have rings the color of their eyes to seal the betrothel. Hehe! It was a random idea! Glad you liked it. A contemporary retelling---look forward to your challenge posts again this year, Anna! Looking forward to yours too! I loved that bit - I was trying to follow it, though. Was the princess meeting the prince posing as a commoner, while avoiding meeting him as his betrothed? ;) Fun stuff, though I have to wonder why she's keeping up the masquerade. It's something along that lines. The princess met the prince whilst she was posing as a commoner. She doesn't want to break her masquerade now as it will kind of derail a lot of her plans as she's not sure how far she can trust him yet. I love coming across things I wrote years ago. My dad recently unearthed a series of stories about unicorns I wrote around age 5 via dictation. It's kind of delightful to see what you were playing with back then...I put up a video I made almost ten years ago in my Letter C post for the challenge, and even though it's mildly embarrassing it's still got things in it I appreciate. Glad you're finding fun stuff in old work!